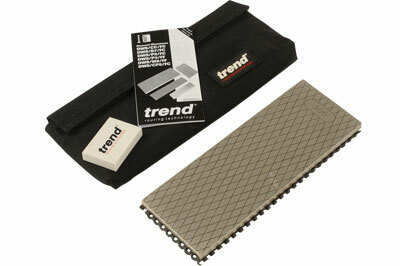 Trend have been bringing us a number of very useful diamond sharpening products for some time now. What I wanted to try was a diamond plate that was the best of all worlds: double-sided with both coarse and fine grits, and large enough for any plane or chisel iron. The answer is their improved double-sided whetstone with both 300 and 1,000 grades. The coarse side has a diamond pattern intended to help prevent clogging when creating the initial edge before turning it over for the fine finish. It comes with a non-slip mat and pouch and a rubber to keep the faces clean. Of course it wouldn't be complete without their lapping fluid which, unlike the image on the box that features a pump spray, has instead a flip-up lid for squirting on the diamond plate. While you can use a diamond plate dry or with standard tap water - which won't stay on the plate due to surface tension - lapping fluid has low surface tension and prevents rusting of tools. A note about working with diamond plates. Just like any other abrasive medium you are effectively 'roughing up' a surface or surfaces in order to make it very smooth, which seems ridiculous but true. Diamond plates are 'raw' when you buy them, and it is only after a while that the rawness goes and they give a better, silkier finish to cutting edges. As I write this review the Trend plate has had very little use so it sharpens perfectly, but with a rather 'mean' edge to it which won't last for long. Another point is that not all tool steels are the same in their composition, so an ordinary plane or chisel blade may have too much of a 'wire edge' to remove once sharpened, whereas say an O1 carbon steel blade is harder and has only a fine wire edge to strop off after sharpening. Having said that, I decided some time ago that diamond plates are the most reliable and consistent method of sharpening for me. 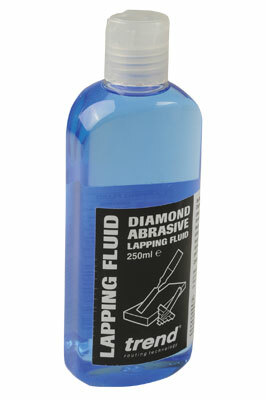 The lapping fluid is convenient and there is no immediate rust worry afterwards. 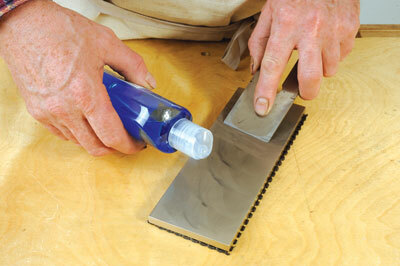 A really good working combination in the workshop or on site and a worthwhile investment.